PERSONALIZED PINK AND GRAY ELEPHANT BABY SHOWER DECORATIONS! Here is a fun idea for a baby shower. How about having a backyard barbecue. A family member’s backyard would be a great place for everyone to linger without time limits of a rented facility. There’s something to be said for having the comforts of home! The main gift, the baby, will soon be here! What better way to celebrate than with a lot of happy memories that will last a liftetime! We are expecting a baby granddaughter in a few months. I know the excitement and anticipation! Elephants are such beautiful creatures, why not bring them into the celebration as well? Add text, names, and other information, personalizing these Pink and Grey Elephant Baby Shower Decorations. Aren’t these Baby Elephant Baby Shower invitations adorable! And there are many choices to customize, including paper type. Options include adding a pearl shimmer or even felt, or linen type paper. Different options for shapes are even available! You can customize each and every product with names, dates, phrases or anything else. Make sure this day is memorable! Welcome the baby to its new world of family and friends! Customize and personalize any of the Baby Shower Elephant Invitations. The Baby Elephant flower can be customized to whatever color you would like, creating a unique mascot of sorts for your Baby Team! Yea! To custom order your Pink and Grey Elephant Baby Shower Decorations and invitations at no extra charge, just call Linda at 239-949-9090 and tell her Beverly sent you. Personalize these Cute Save the Date Baby Shower Post Cards! What a great Save the Date Baby Shower invitations will start the whole show. What awe-some cuteness! As you can see, fill in the information in an attractive way, inviting everyone to remember the upcoming date! More about stickers down below! Be sure to see the matching stamps too. CLICK ON SAVE THE DATE POSTCARD! 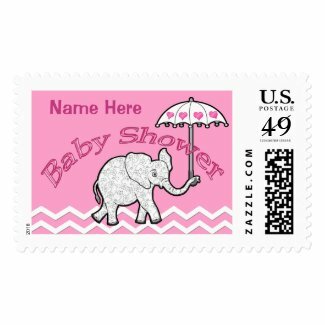 Start the celebration with a real U.S. Postage Stamp with our team Elephant Baby Shower leading the way! 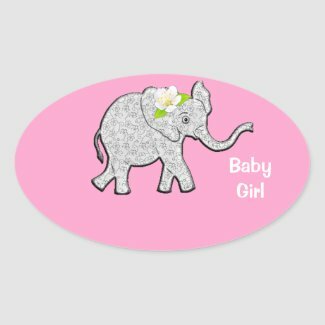 Yes, a real Pink and Grey Baby Girl Elephant Baby Shower stamp! There are three options to choose from. Two options can even be personalized! Of course, Zazzle has to approve the text. This Baby Shower Elephant Stamp will be a stamp worth collecting! And certainly a terrific way to invite and welcome everyone over! To customize a Baby Elephant for your special baby, click above, on the red “Click Here” button, then click the “Customize” button under the stamp. 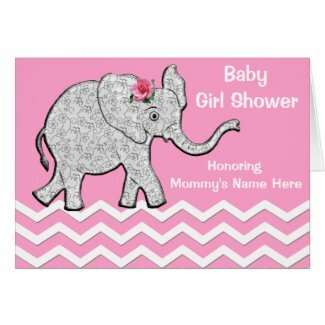 Be sure to preview how the Baby Shower Elephant will look with your special name. Easy! 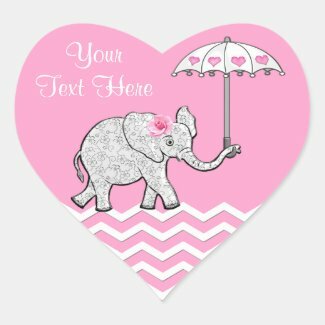 Baby Elephant Stickers with your TEXT! Hand write each of your guests names on the first baby shower stickers and or change the “Baby Girl” text to Your Text in the text box templates which are located to the right of each personalized baby shower stickers. 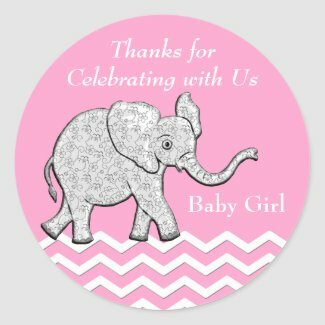 Thank your guests with with cute elephant baby shower favors stickers which is also customizable with your text instead of ours. Ahh-some! Baby Shower Elephant Plates and Napkins! Click above for personalized elephant themed baby shower plates and napkins. What a really a cute combination! And remember, there are great discounts for buying in bulk! There is even keepsake dinnerware that can be personalized! Click to pick and choose, and to easily customize your order of plates and napkins. Plus, find many other items that are available with our cute, lovable pink and gray baby girl elephant! Bring sunshine to your upcoming baby shower! Find more exciting Pink and Grey Elephant Baby Shower Decorations by clicking above. It makes sense we should send these out so our baby shower will be a couple of months before the due date so Mom and Dad will have time to get things settled. The date could vary a few weeks, considering the season and weather. The perfect time to send out invitations would be about three and a half or four months before the due date. Fun With Elephant Baby Shower Stickers! In addition to the cute invitation, inside the envelop will be a Baby Heart Shaped Elephant Stickers! Here’s a fun idea! Send guests a heart-shaped Baby Shower Girl Elephant-Theme sticker along with their invitation! Have the guests write their own suggestion for what the baby’s name could be. Especially cool idea if Mom and Dad are keeping the name a secret. Now that could start some fun! Great memories looking back on at all the possibilities of what the baby could have been named! Place the names in a bowl for a fun game later! Add your own TEXT to these cute girl Baby Elephant heart-shaped stickers is to thank the guests for coming and celebrating with a personalized message. Thank you for coming to the Baby Shower! Elephant baby shower Thank you Cards! CLICK ON THANK YOU CARD! Pink and Gray Baby Shower thank you cards! Thank your guests for sharing in your celebration! Customize by adding a bow in a color of your choice! Add your TEXT to the cover, inside, and also the back! Tell your friends know how much you appreciate their coming and sharing in your celebration! To custom your Pink and Grey Elephant Baby Shower Decorations and invitations at no extra charge, just call Linda at 239-949-9090 and tell her Beverly sent you. The Parents Website has great guidelines and helpful hints for putting on a baby shower. Don’t get all wet ~ check it out! How exciting to have a baby coming! Now you know when to send out the invitations and the save the date cards. There are really cute ways of gathering your friends and family together to celebrate this new baby with these cute Baby Elephant-themed baby shower invitations! I look forward to hearing about your awesome baby shower! Share your plans and the fun you’re having planning this awesome baby shower! We have a new generation to look forward to and much to celebrate! Look forward to exciting new ideas and ways to celebrate with our Pink and Grey Elephant Baby Shower Decorations in Baby Boy or Girl Elephant themes, due date any day now!